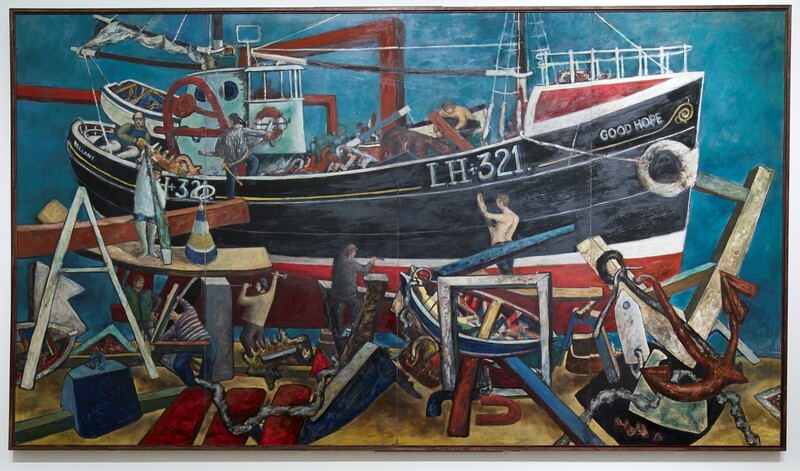 After remaining in private ownership for some 55 years, one of the earliest and most significant paintings by internationally acclaimed artist the late John Bellany CBE, will go on permanent public display as part of the Scottish Maritime Museum’s new national art collection, it was announced today (Friday 28 September). The painting was most recently displayed in the National Galleries of Scotland 2012, John Bellany Retrospective. Commanding over 3 metres by 5 metres, the huge oil on board painting captures construction of a seine netter inscribed with the name ‘Good Hope’ and the word ‘BELLANY’ at the stern. Unveiling ‘The Boat Builders’, David Mann, Director of the Scottish Maritime Museum, said: “Since 2015 when we embarked on our ambitious, three year art acquisition project, SMMart: Enriching the Imagery of Scotland’s Maritime Heritage, it has been our fervent hope to collect a significant work by internationally acclaimed artist John Bellany as the ‘jewel in the crown’ of our new national art collection. Fiona Greer, Curator of Art at the Scottish Maritime Museum, said: “Bellany and his close friend Alexander (Sandy) Moffat were inspired by social realism and the desire to present a modern Scotland whilst embracing the nation’s heritage. ‘The Boat Builders’ is an exciting and important example. The Scottish Maritime Museum’s new art collection was created to enrich and enhance the nationally recognised collection of maritime heritage at the Scottish Maritime Museum. The art collection has been made possible by a grant from the Heritage Lottery Fund’s Collecting Cultures programme, with further support from Art Fund and the National Fund for Acquisitions. Established in 1983, the Scottish Maritime Museum is recognised as the principal resource for material relating to Scottish Maritime history, in particular shipbuilding and marine engineering. The Scottish Maritime Museum is based on the Harbourside in Irvine, North Ayrshire, and Dumbarton and buildings and sites occupied are part of the collection themselves: The Scottish Maritime Museum in Irvine is housed within the Linthouse, theA listed former Engine Shop of Alexander Stephen and Sons which was built in 1872 and salvaged and relocated from their derelict Linthouse shipyard in Govan during 1991. The Scottish Maritime Museum in Dumbarton is located on the site of the former innovative William Denny Shipyard and features the world’s first commercial ship model experiment tank, the Denny Ship Model Experiment Tank. The SMMart enables the Scottish Maritime Museum to discover, acquire and present artworks, which help bring the Museum’s amazing maritime collection to life. Equally, it is enabling the Museum to create a visual art collection, which is significant in its own right and can attract visitors from across Scotland. The Museum is collecting art over ten years in age across a wide range of mediums including oil paintings, watercolours, drawings, sketches, photography, posters, sculpture, textiles, historical travel posters and mixed media and installation work. The focus is on original work and, in the case of historical travel posters, rare designs with limited print runs.Subjectsinclude Scottishshipbuilding and engineering scenes, coastal scenes and works connected to the River Clyde, maritime workers and people involved with the sea, early shipping and depictions of Scottish built vessels before photography was standard. The Museum is also keen to attract potential donors gifting or loaning artworks appropriate to a national collection. The Museum is working closely with other UK museums, which collect maritime art. The Heritage Lottery Fund Collecting Cultures Programme enables museums, libraries and archives to strengthen and enliven their core collections through strategic purchase. Thanks to National Lottery players, we invest money to help people across the UK explore, enjoy and protect the heritage they care about - from the archaeology under our feet to the historic parks and buildings we love, from precious memories and collections to rare wildlife.www.hlf.org.uk. Follow us on Twitter, Facebook and Instagram and use #HLFsupported. Art Fund is the national fundraising charity for art. In the past five years alone Art Fund has given £34 million to help museums and galleries acquire works of art for their collections. It also helps museums share their collections with wider audiences by supporting a range of tours and exhibitions, and makes additional grants to support the training and professional development of curators. Art Fund is independently funded, with the core of its income provided by 139,000 members who receive the National Art Pass and enjoy free entry to over 240 museums, galleries and historic places across the UK, as well as 50% off entry to major exhibitions and subscription to Art Quarterly magazine. In addition to grant-giving, Art Fund’s support for museums includes Art Fund Museum of the Year (won by Tate St Ives in 2018) and a range of digital platforms. The National Fund for Acquisitions, administered with Scottish Government funding by National Museums Scotland, contributes towards the acquisition of objects for the collections of museums, galleries, libraries and archives throughout Scotland. During financial year 2017/18, the NFA made 48 payments totalling £129,085 to 29 organisations, supporting acquisitions with a total purchase value of nearly £367,740.